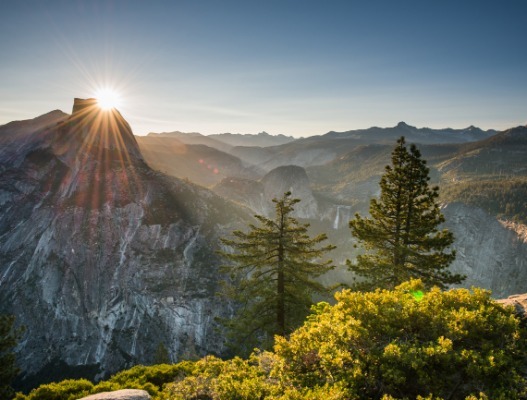 Early Spring is an ideal time to be in Yosemite and the Sierra Nevada. The waterfalls are flowing, dogwoods are in bloom and the river is rushing. Get an early start! This is a full day’s worth of activities. From the Visit Yosemite | Madera County visitors center in Oakhurst: Go northbound 14 miles on Hwy 41 to the Yosemite Park south entrance. Stay on Hwy 41 (Wawona Road) all the way to Yosemite Valley. 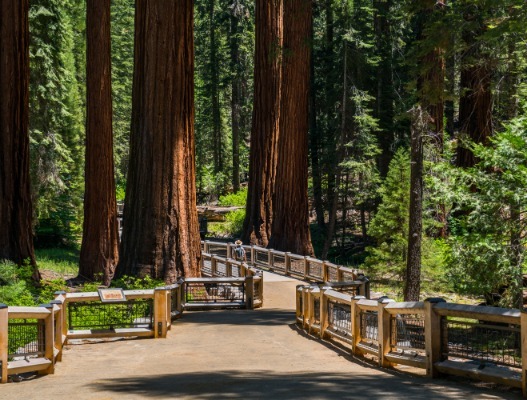 (Park entry fee is $35 per car, good for 7 days; if you are 62 or older and a US citizen or permanent resident, you can obtain a Senior Pass for $80, good for life for all National Parks). Hike to the Grizzly Giant, the largest tree accessible to the public, 2 miles round trip - MODERATE Journey to the Upper Grove cabin and Wawona Point, 6 to 7 miles round trip – STRENUOUS (check to make sure this trail is open – may be closed due to snow) For those with a handicap placard, you can drive to the parking area near the Grizzly Giant to enjoy a short, accessible walk to the Griz. Seven handicap spaces are available in that lot, along with restrooms. 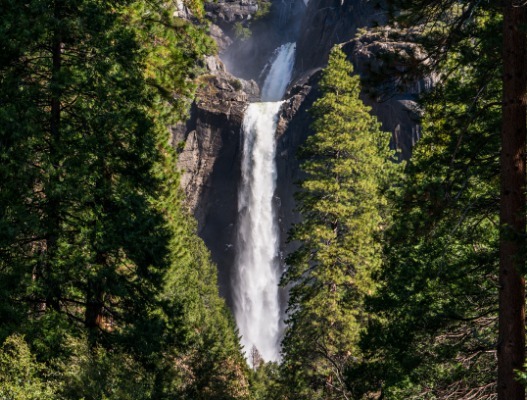 Hike Chilnualna Falls (moderately easy to first cascade—2 mile round trip. strenuous to upper cascades, 8 mi round trip, 2,300 ft elevation gain, possible snow on trail). Take Glacier Point Road out 16 miles to the point; return the way you came (seasonal road). Special note: It may be closed due to weather. The Park Service tries to have Glacier Point Road open by Memorial Day weekend. Hike McGurk Meadow – spectacular wildflowers in late summer - easy 2 miles. If you hike to creek crossing, you may find head-high wildflowers in bloom. Hike to Dewey Point – moderate, 8 miles round trip, stunning views. Hike to Sentinel Dome - moderate, 2.2 miles round trip, best 360-degrees views of valley and high country. View Nevada and Vernal Falls from Washburn Point and Glacier Point. Birds’-eye view of Yosemite Valley from 3,200 ft above valley floor. From Glacier Point, turn right on Wawona Road; continue down to Yosemite Valley. You will go through a mile-long tunnel. Tunnel View – Immediately after exiting tunnel, park on right or left. Watch for traffic! Spectacular view of Bridalveil Fall, Half Dome, Clouds Rest, El Capitan. Quintessential photo opportunity! 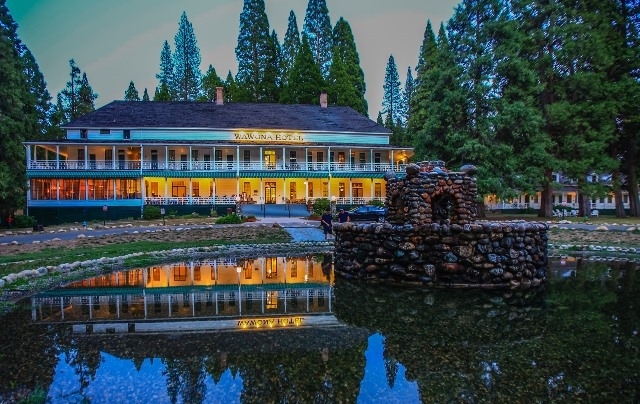 Oldest building still in use in Yosemite Valley, dating from 1879, and spectacular view of Yosemite Falls from outside chapel. From Yosemite Chapel continue to Sentinel Bridge. Turn left over Sentinel Bridge and park at Shuttle Stop 11. Walk back to middle of bridge. This is one of the best-know photo locations in Yosemite - Half Dome over the Merced River. DAY PARKING: – Park your car and forget it for the rest of your visit to Yosemite Valley, until you’re ready to leave. Hike to Nevada Falls – 1 mile to top of Vernal Falls (very steep stone steps; you will get quite wet in spring/early summer) – another 2 miles to top of Nevada Fall. Mirror Lake – walk out about 1 mile to Mirror Lake for an up-close view of the face of Half Dome. It’s an easy walk for a big payoff. Watch for the big pullout on the left as you approach the Pohono Bridge. You'll often find "green dragon" tram tours there. This view from here is a panorama of Yosemite Valley from a different perspective. 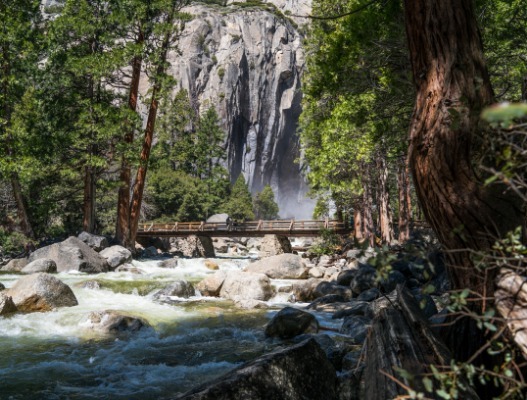 If you have time and the road is open, don't miss the opportunity to view the Yosemite high country up-close-and-personal by traversing the Tioga Road, which goes across the park to the east side of the Sierra Nevada. For some of us, this is the most beautiful, most spectacular part of the park.